Surviving as a lone wolf is difficult, but for Isabelle, the winter of 2013 posed a greater challenge. Targeted by another female and her two companions, her life was in danger as they attacked with the intensity used to take down a full size moose, jaws clenching hard aiming to rip muscle from bone. Had these wolves known that Isabelle, a close relative to every male wolf on the island, had low reproduction potential, perhaps they would have realized that she was not a threat. But for her female assailant, she was seen as breeding competition to eliminate. Wolves have inhabited Isle Royale since 1949 when a pair crossed an ice bridge spanning the 20 miles of Lake Superior separating the island from the mainland. Their numbers rose until 1980 when their population size plummeted from 50, the all-time high, to 14 in just two years after evidence of a deadly canine parovirus was first seen in the blood of the animals. 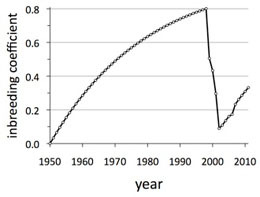 This population crash drastically shifted the wolves’ population dynamics. Before the crash, wolf numbers fluctuated based primarily on the number of older moose on the island, but after, there was little correlation. Instead, the genetic effects of their isolation took hold. With a limited gene pool, wolves have become more inbred with each generation, allowing recessive traits that require inheriting a copy of the gene from both parents to become more common. For example, lumbosacral transitional vertebrae (LSTV), a recessive deformity of the spine that likely damages nerves controlling tails and hind legs, is normally seen in 1% of wolves but on Isle Royale, 33% have it. Such a deformity inhibits a wolf’s ability to hunt, making it difficult to get food necessary for survival. While the level of inbreeding has increased over the years, introduction of a new set of genes with the arrival of an immigrant wolf rescued it and helped the population grow for a time. 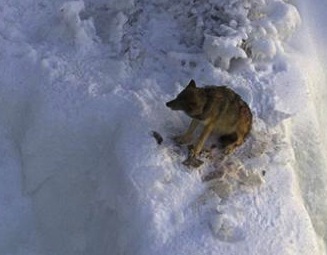 This wolf, nicknamed the Old Grey Guy, crossed another ice bridge to the island in 1997, and following his arrival, the population size rose again. The inbreeding coefficient, an indication of genetic diversity in the population measured from zero (non-relatives) to one (complete relatives), peaked around 2000 at 0.8 before falling to 0.1 just a few years later as the pups that the Old Grey Guy sired became a part of the adult population. This coefficient is on the rise yet again, reaching 0.3 in 2010 as his descendants become more prominent in the population. At the same time, the population size peaked at 30 in 2006 before dropping to nine wolves in 2012, the lowest observed number on the island in the 55-year study. As the single remaining member of the Middle Pack, a specific wolf family on the island, Isabelle’s female assailant is likely the most genetically diverse female on Isle Royale. Such genetic diversity is necessary to produce offspring that do not have harmful recessive traits and so are capable of surviving. So, while Isabelle fights for her life, her assailant fights for the prolonged survival of wolves on the island. Nonetheless, the Old Grey Guy’s introduction of new genes shows that inbreeding is inevitable in the isolated population. The female assailant may be able to produce viable offspring for now, but the issue remains of the imminent decline of genetic diversity in future generations. This inbreeding will lead to a higher occurrence of harmful traits that will threaten the survival of the entire wolf population on the island.